It seems like, every so often, every branch of the military updates its tattoo policy. It’s done for various reasons, but ultimately, it’s to keep an orderly and professional appearance. 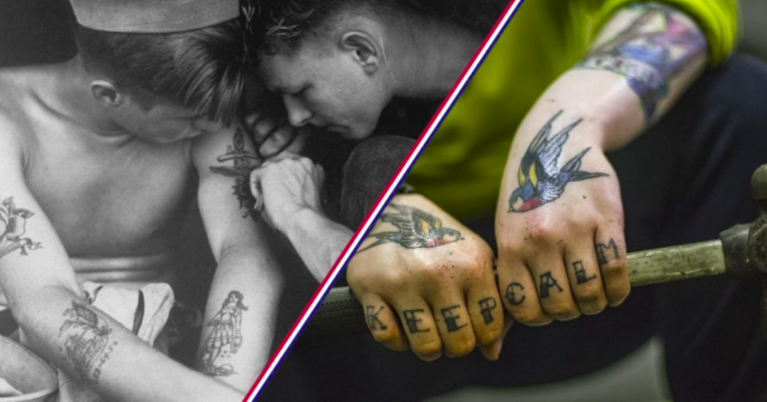 But ever since the first tattoo parlor opened its doors in 1846, tattoos have had a well-seated place in the hearts (and on the skin) of many troops and veterans. The art of body-marking and tattooing as a status symbol for warriors dates back well over five thousand years. Everyone from the Ancient Greeks to the Maori tribes of New Zealand marked their warriors as a sign of their strength. Even before tattoos were widespread among the U.S. military, Revolutionary War sailors tattooed personal identifiers on their skin to avoid being illegally conscripted by the British Navy. Despite a general disinterest in tattoos among civilians in a post-WWI society, the 1925 book, The History of Tattooing, states that a whopping 90% of U.S. Sailors were tattooed. This was the golden age of sailors using their bodies as secondary service records of their achievements. Sailors would get a shellback turtle for crossing the equator, a golden dragon for crossing the International Date Line, and a golden shellback for crossing both at the same spot. Even rarer is a purple porpoise, which is for making this same crossing during the sacred hour of the spring equinox. Seeing a tattoo on an older sailor means either they sailed through a very specific spot at a very specific time — or they just really like purple dolphins. In today’s military, the old traditions still ring true. Sailors will still mark themselves for their Naval achievements. Marines still get the Eagle, Globe, and Anchor on their first liberty. Soldiers will still get one or more of the same six tattoos. And airmen will probably get something nice in a spot that doesn’t hurt too much.